In George Orwell’s 1984, the protagonist, Winston, begins to notice the import of the revisions that he makes to news and history as an employee of the Ministry of Truth. No fact is so set in stone that it can’t be made to look better through revisions of the past. In the real world, nationally, as well as locally here in Rhode Island, the newspapers have been touting the lower unemployment rates. Somehow the massive revision of the numbers and change of the methodology have gone sparsely mentioned. When the BLS revised its state-level employment numbers last month, I tallied up the change. The revision lowered employment — that is, the number of people telling interviewers that they are “employed” — by 76,760 across the country in December. That’s nothing, though. Remember the big surge in employment just before the election? It’s interesting to observe that, according to the revision, the employment numbers were under-counting by 704,784 people in August, 508,764 people in September, 212,647 people in October, and 69,069 people in November. In other words, if we take the revisions as correct, employment increased by more than 600,000 people in the three months before the election just because the numbers were becoming more accurate. I’m not going to pretend to be well versed on every stage of BLS methodology. Even the huge revision in August is only about a half of a percent change in the number of employed Americans, and that’s hardly the stuff of fiction. The Half-Percent Conspiracy wouldn’t make for much of a thriller. Still, it does make one wonder whether the mainstream media isn’t being a bit irresponsible reporting this data with such fanfare from month to month. 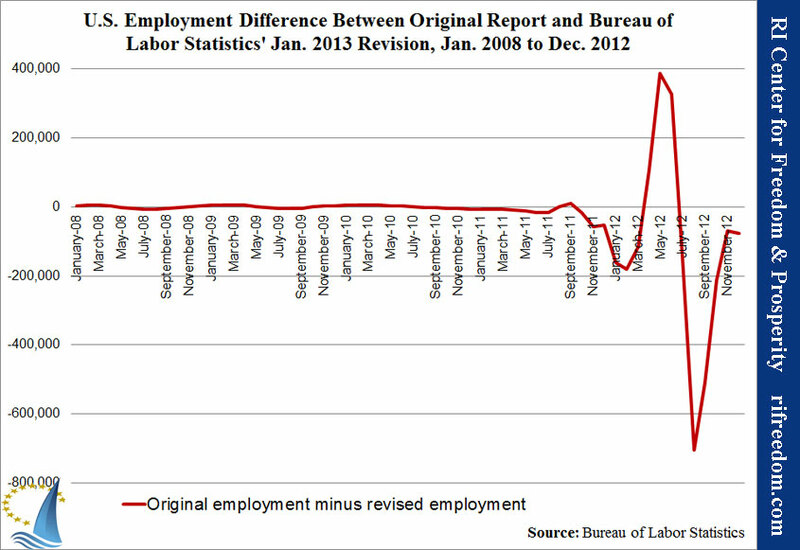 The following chart shows the number of people by which the original data overstated or understated employment, according to the revision. It’s a curious shape, indeed, and to the extent that people base their votes on what they see in the headlines, even relatively small adjustments to data can have huge repercussions for the country.